When Harrods officially opened the doors to the new Wine Shop on the 16th of November, Bisol threw a little celebratory dinner party. You see, Bisol now has a rather nice display amongst Veuve Clicquot, Moët & Chandon, Taittinger and Pommery in the new Wine Shop’s champagne section. Readers familiar with Bisol will know that it is a very highly regarded Italian prosecco producer. First established in 1542, Bisol remains a family run business focusing on producing quality prosecco. As the largest vineyard owner in the Valdobbiadene region, Bisol produces the smallest yield of prosecco. Restricting the amount of grapes produced means that the characteristics of the grapes can be carefully controlled and therefore shaping the wines produced from the grapes. And those familiar with wines will know that prosecco is not the same as champagne. Champagne must be sparkling wine produced within the Champagne region of France. Prosecco, while primarily Italian, is also produced elsewhere in the world using only glera (prosecco) grapes. The production method is different too. Champagnes go through secondary fermentation in the bottle while for proseccos, the secondary fermentation takes place in stainless steel tanks. The placement of Bisol proseccos amongst champagne heavy-weights can only signify the quality of Bisol prosecco and the increasing popularity of proseccos in general among the British public. 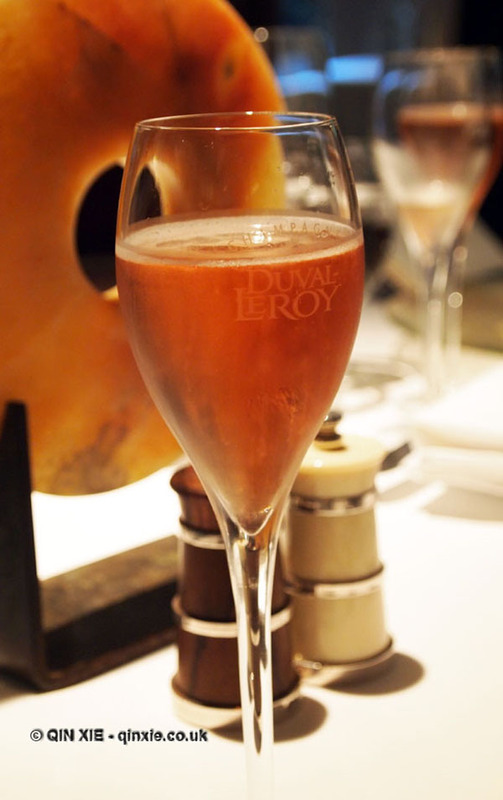 The dinner took place in the private room at Le Café Anglais, the French inspired restaurant of FT columnist and chef Rowley Leigh. To start there was a nice little introduction to Bisol at the bar with the Jeio Brut Valdobbiadene Prosecco Superiore D.O.C.G. Spumante as an aperitif, served with small bar snacks. It was light, refreshing and rather fruity, a perfect facilitator for meeting and mingling. 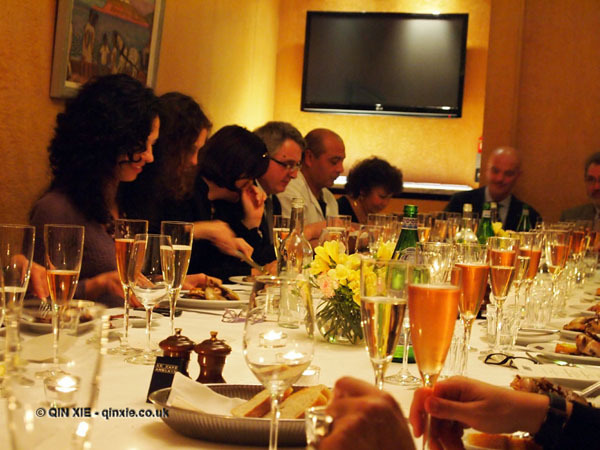 Once the entire party has arrived, a mix of Italian and British media, we moved into the Private Dining Room of Le Café Anglais. The President of Bisol Wines, Gianluca Bisol, was on hand to introduce the evening and also a little bit about each of the Bisol proseccos we were enjoying. The first course was a wild duck pâté en croute served with a dandelion and orange salad, matched with Bisol Cartizze Valdobbiadene Superiore di Cartizze D.O.C.G. 2009 Spumante Dry. It is usually served as a dessert wine or aperitif and it’s actually quite sweet in taste despite being labelled dry thanks to the natural sweetness of the grapes. You are probably also beginning to wonder whether all Bisol wines have such long names. In most cases they do and it’s all down to the careful classification of the wines in the region to define variety and quality. This one is produced from grapes harvested from the hills of Cartizze, a location so prime that a hectare is estimated to be worth over $1million. That is, if there were any willing sellers. The second course was roast partridge with radicchio, cobnuts and fondant potatoes matched with Jeio Rosé Spumante Brut. This wine contrasts sharply with the last one – it is a lot drier and almost tastes a little bitter. As I prefer sweeter wines, it wasn’t for me although it did pair very well with the gamey partridge. For the final course, we had the bitter chocolate tart with Bisol Duca di Dolle Prosecco Vino Passito. There was also a cheese course available for those more savoury minded. The bitter chocolate tart was truly delicious. It was a rich melting delight of dark chocolate on a very thin crust. I was pleased to find that the wine was back to sweet and this one was super sweet with a sugar content of 100g per litre. It’s also considered a rare wine, as production is limited to a few thousand a year. This was certainly one to be savoured as we wound down the evening. But not before Rowley Leigh enters to meet his happy diners and offer us teas and coffees.